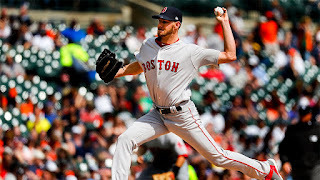 Nick Castellanos drove in a run with a single in the bottom of the eighth inning off Red Sox starter Chris Sale to snap a 1-1 tie and lift the Tigers to a 2-1 win Monday afternoon at Comerica Park. Sale (pictured) and Justin Verlander were locked in a pitcher's duel that lived up to all expections. Verlander allowed just one run on three hits over seven innings. He walked a pair and struck out four, even though his first K didn't come until the fourth inning. Sale struck out ten, marking the 36th time in his career that he's struck out ten or more in a game. Boston pushed a run across in the top of the second. Brock Holt grounded into a double play with Mitch Moreland scoring in the process. Detroit answered back four innings later on a solo home run by Ian Kinsler. Moreland led Boston with three hits including a pair of doubles. Dustin Pedroia extended his hitting streak to six games.